Before I left Yuma I called Liam, the camp host of the Tempe Elks Lodge. He assured me that there was a spot available. This is the 2nd year I will be staying there. It is convenient for a few games and is in a location I am familiar with. Plus the fact that there is full hookups will really make it comfortable in the heat. So off we went. It only took a few hours to get there and when I did I looked up Liam. I mentioned that I had parked last year in the space right behind his rig. However this year he said my rig would be hanging out too far and wouldn’t let me stay there. There didn’t seem to be any other space available so i started looking on my GPS for other campgrounds nearby. Then Liam came running over and said he had a space for me. The guy on the end space was moving so I was able to take his spot. After parking I went into the lodge, enjoyed a beer and paid for 9 days at $20 per day. My son Curt will be flying in on Thursday so I will have a few days to myself to do laundry, shopping, etc. The Elks Lodge was having a Saint Patricks Day dinner so I planned to go to that. Of course I had to have a couple of Guiness to start off the celebration then I had a delicious corned beef and cabbage dinner. It was one of the best I have ever had or was it the Guiness talking to me. HA! I was checking out my email on my iPhone when I realized that Barb and Chuck (my friends from my Amazon days) were in the area. I called them and low and behold they were in Mesa just a hop, skip and jump from me. So off I headed to Mesa to meet them at an Irish Pub. It was great seeing them again and we had a lot of catching up to do. Then we were going to another place they had mentioned and in the process of driving over there my car started to die on me. Fortunately we were stopped at a light and I was able to get there attention. Chuck and I pushed the car through the light and into a parking lot where I called Coach Net to get a tow back to the Elks Lodge. Within an hour the tow truck was there and I was on my way back to the Elks with my broken down car. I knew what the problem was since I had the same problem in Fernley when I was there. ALTERNATOR!!! I had my alternator changed twice while in Fernley. The first time the alternator was defective and they replaced it again. It has only been in the car for a few months and now is bad for the third time. I wasn’t sure what to do with the car in the morning. I looked on Yelp and low and behold there was an 5 star auto repair joint just 2 blocks away. I walked down there to see when they could get to it. They were very busy but would try to fit me in on Thursday. So now I am without a car and my son was flying in on Thursday. I decided to call Enterprise to see about renting a car for a couple of days. I also contacted my son and told him to take a shuttle to the Elks Lodge as I wouldn’t get the car for a couple of hours. Then Gene’s Auto Worx called me and said it was the alternator and they would tune it up as well. They said it would be done in the afternoon. First I have 0 cars in the morning and now I have 2 cars in the afternoon. DUH! I called Gene’s back and asked them if they could hold the car until tomorrow after I return the rental car. What a day! This is the 2nd annual spring training we have planned. We will be going to 2 baseball games and a hockey game. The first baseball game was in Glendale which is way on the other side of Phoenix about 25 miles from the Elks. 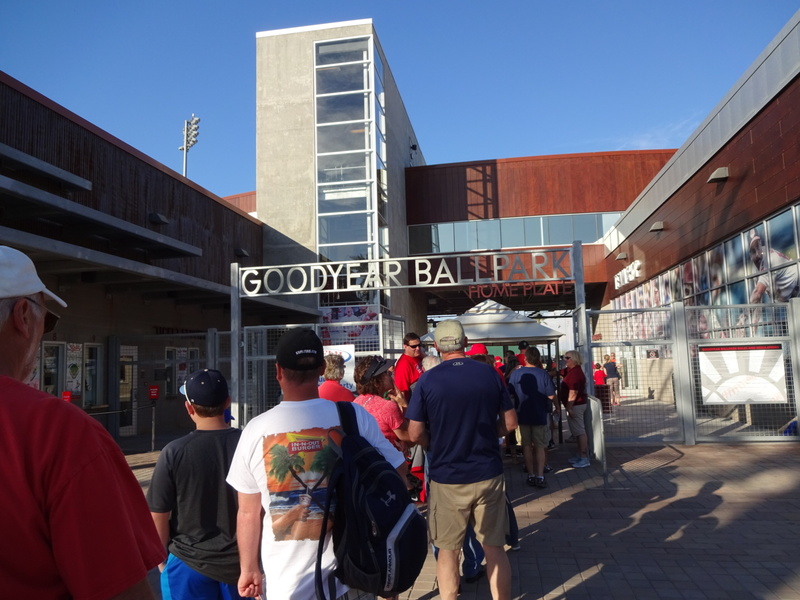 We saw the Angels play the Indians at Goodyear Ball Park. The two best players on the Angels. 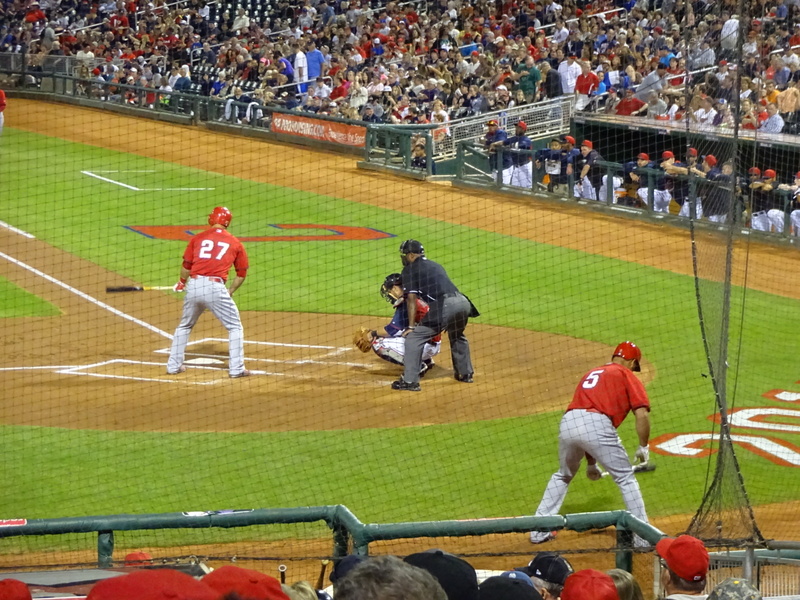 Mike Trout at bat and Albert Pujols in the on deck circle. 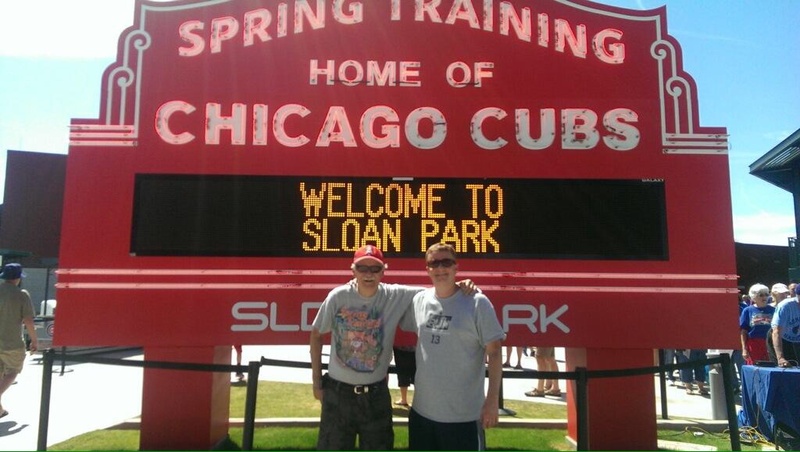 Two of the best fans during Spring Training. The hockey game was also 25+ miles from home so we did a lot of driving on those days. 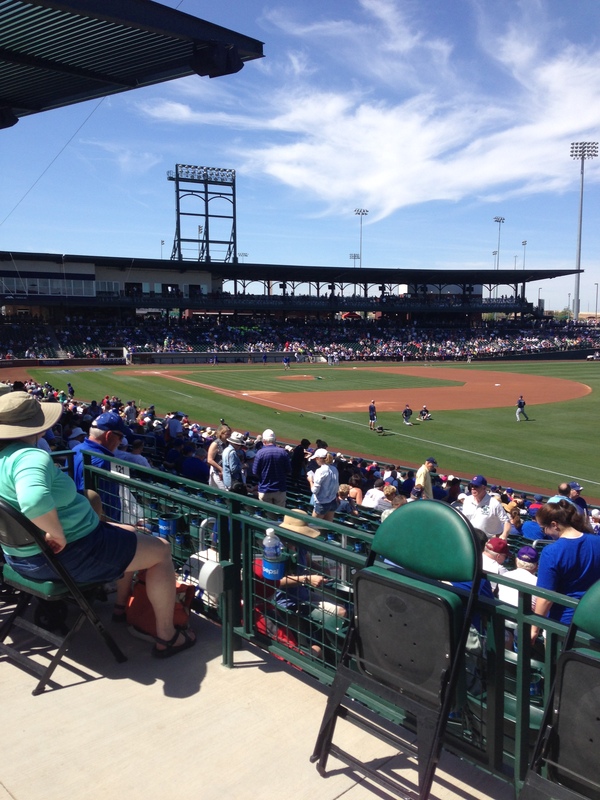 We also wanted to see the new Cubs ballpark in Mesa which wasn’t as far. Here are these same two goofy fans. HA! Before we went to the first game we stopped by Arizona Casino to try our luck. I was lucky right from the start. I put $40 in a slot machine and won $90, then ran it up to $140. Then I tried my luck at a progressive machine and low and behold I hit a jackpot of $522. I couldn’t believe it. I have never been lucky before except in small amounts. I immediately cashed out and called it quits. The ballgame was fun especially since the Angles trounced the Indians. Lots of action and in one inning the Angels had 4 triples. WOW! The hockey game was very exciting and lot of noise. It was a great time. 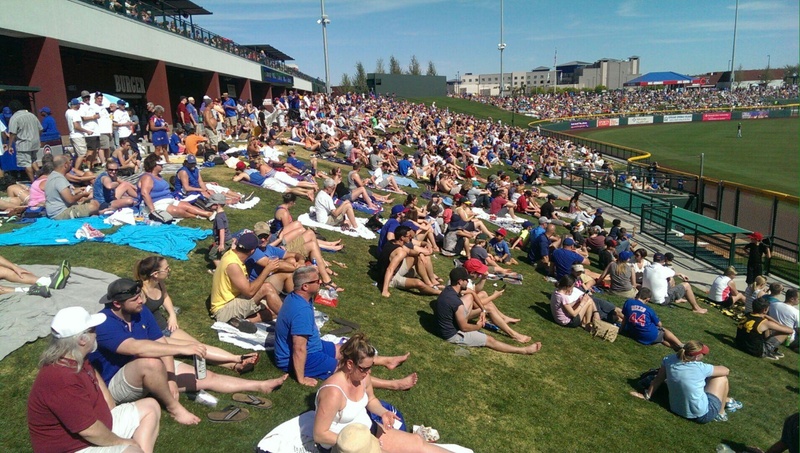 Our last game was a Padres/Cubs game at the new ballpark in Mesa they built for the Cubs. A great park and another fun game. We went to a Gordon Biersch Brewery where we had ate last year as well and sat on the balcony overlooking downtown Tempe. It was a great dinner and capped of our 2nd annual spring training. We are already making plans for the 3rd annual and discussed some options like different ball parks. I was going to leave on the 24th and head to Yuma to exchange my hearing aids for a set that comes with rechargeable batteries. I don’t want the hassle of buying batteries all the time. When I got to Yuma I had a big surprise. I pulled in the Casino parking lot right across from Chris. He had just returned from a few weeks in Mexico and we had a lot to talk about. Later in the afternoon Debby and Kim picked us up and we went to the Elks for a great dinner and lots of catching up with what everyone was doing. It was a great time, but unfortunately didn’t get any pics. After picking up my hearing aid charger I made a beeline to the Oceanside Elks in Oceanside, CA I will be here for several weeks to take care of business and just plain relax by the ocean. 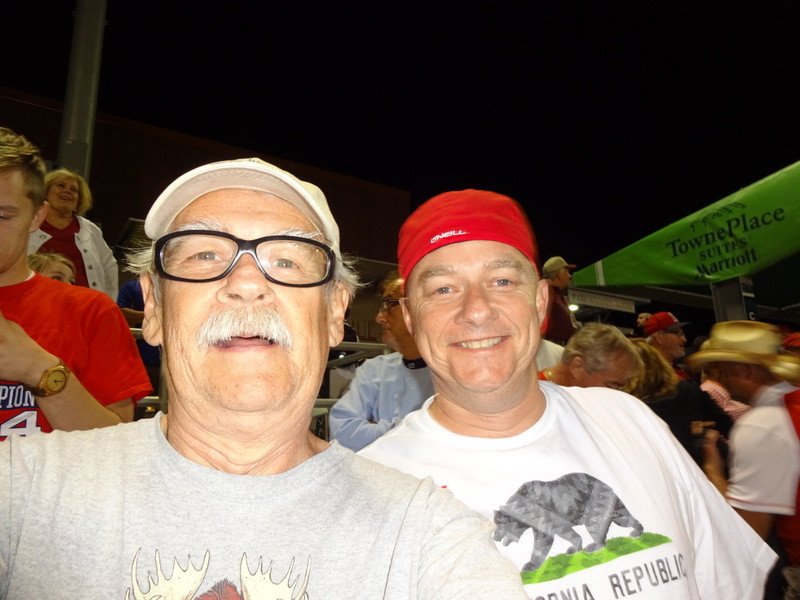 This entry was posted in Arizona, Baseball, Friends, Goodyear, Mesa, Spring Training, Tempe and tagged Angels Spring Training, Friends, Hearing Aids by Jim Melvin. Bookmark the permalink. 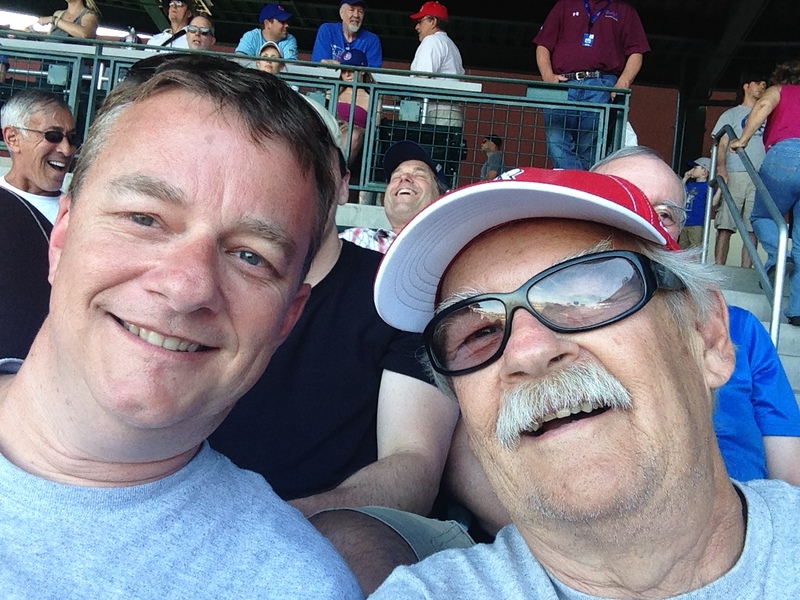 So glad you had a great time with Curt. Enjoy! Sounds like you had a great time. I hope your alternator woes are behind you now and you’re relaxing by the Pacific! Glad to see your post. Sounds like you had a great time with your son. Sorry about the vehicle issues, but hopefully you’ll be good to go for a while. Enjoy your time at on the coast and keep those posts coming!